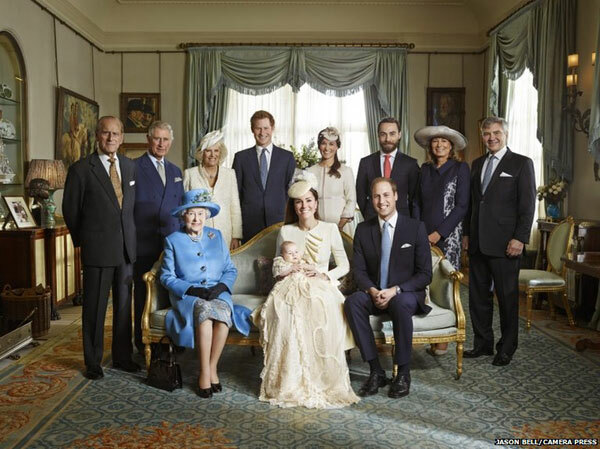 Prince George was Christened on the 23rd of October 2013 in an intimate ceremony at the Chapel Royal, St James Palace with just twenty two members of the Royal Family in attendance and baptised by the Archbishop of Canterbury, the Most Rev Justin Welby. 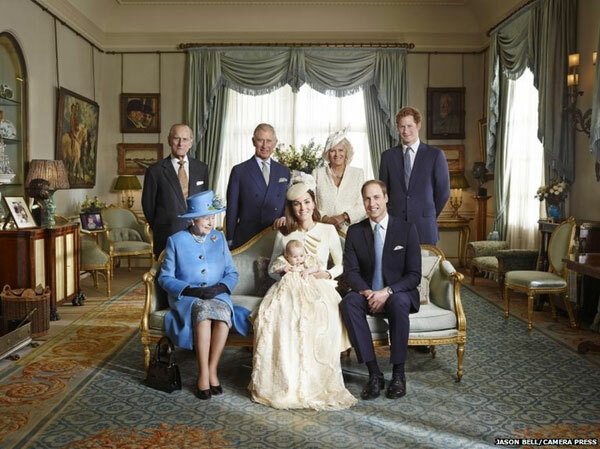 Prince George was dressed in a traditional elaborate christening gown, a copy of the original Christening Robe crafted in 2008 by couturier, Angela Kelly. The original was made of finest Honiton lace and lined with white satin, and was designed in 1841 for the christening of Victoria Princess Royal, the eldest daughter of Queen Victoria. It has since been worn by over sixty royals on their christening day including the present Queen and was designed by the Embroiderer to the Queen, Janet Sutherland, the daughter of a Scottish coal miner. 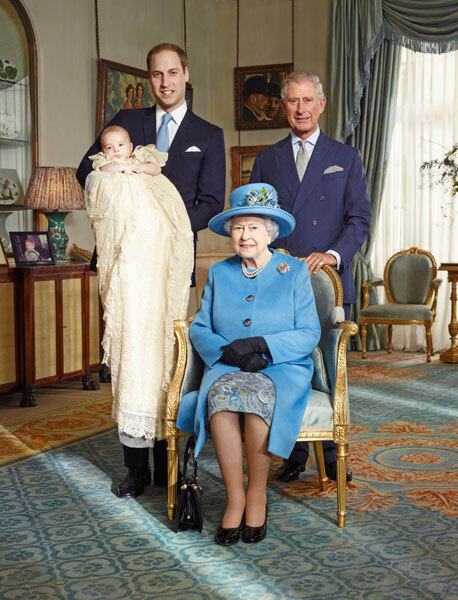 Photographs were taken for posterity by Jason Bell, 44 at Clarence House. 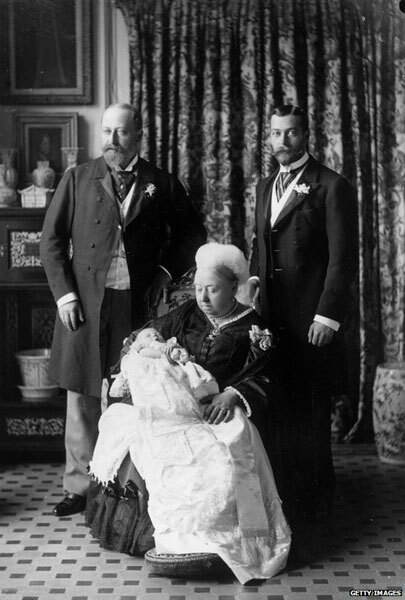 The event was history in the making as the last occasion when three future kings of the British Royal Family posed for such a photograph was a 114 years ago in 1899, when Queen Victoria aged eighty, posed with her direct successors Edward VII, George V and Edward VIII. 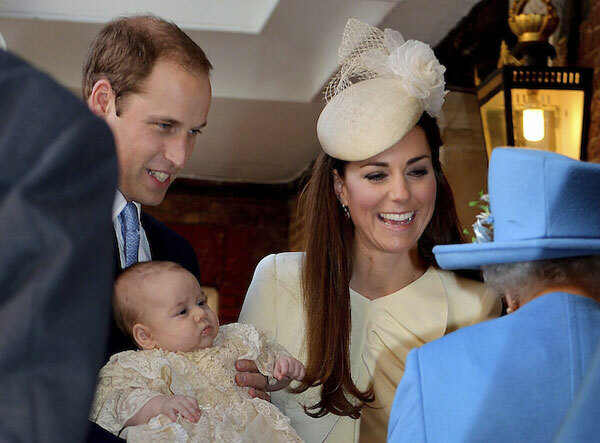 Prince George was born on the 22nd of July 2013 to the Duke and Duchess of Cambridge- William and Kate. 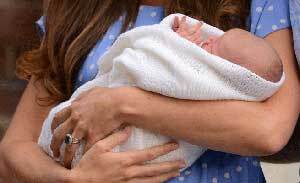 He was born at the Lindo Wing of St Mary’s Hospital, Paddington at 4.24 pm weighing in at 8lb 6oz and is th ird in line to the thone as the latest addition to the British Royal Family Tree. He was introduced to the outside world the following day when he left with his parents to go to his new home at Kensington Palace. He was named the following day on the 24th July as George Alexander Louis Windsor and will be known as His Royal Highness Prince George of Cambridge, but already has a nickname, Georgie from his grandfather Prince Charles. In less than twenty four hours, Prince George was on the move again when he left Kensington Palace with William and Kate to visit his maternal grandparents at their family home in Bucklebury a village and civil parish in West Berkshire. If as expected he eventually becomes king George VII he will not only rule the United Kingdom, but also fifteen other commonwealth countries that have the British monarch as head of state if none change their constitution in the meantime. However that could be at around fifty years time. To celebrate his birth a limited number of lucky children who were born on the same day will have the opportunity to receive a commemorative silver penny. 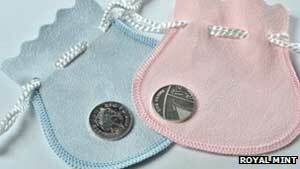 According to folklore, crossing the palm of a new born baby with silver or offering them a silver penny is the traditional way of wishing them a wealthy and healthy life. Parents of the lucky newborns who share their birthday with Prince George will need to apply online for one of the silver pennies by visiting Facebook.com/theroyalmint. Parents 60 days to register for the coin from the birth date, and have to provide a copy of their child’s birth certificate to qualify. Shane Bissett who is the director of commemorative coins at the Royal Mint, said: “The birth of the royal baby will be a joyous occasion not just for Their Royal Highnesses the Duke and Duchess of Cambridge but also for the whole nation, as we prepare to celebrate another remarkable milestone in their life journey together. “However, it will also be a special day for many mothers and fathers across the country as they too welcome the arrival of their new baby, hence why we wanted to extend this historical moment to them with a lucky silver penny”.